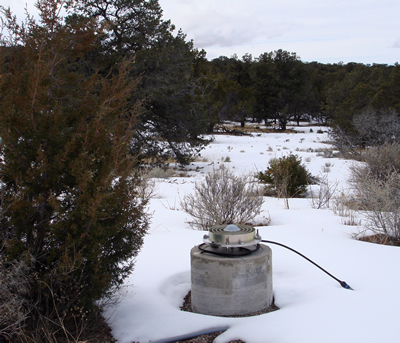 The Pie Town, New Mexico, (PIE1) GNSS station had been exhibiting tracking problems for the past year or so, with periods of acceptable performance interrupted by poor tracking. Several issues made the performance problems difficult to diagnose. These included: the intermittent but somewhat periodic nature of the problem, H-Maser problems which resulted in two units being swapped out by the National Radio Astronomy Observatory (NRAO), the old water logged GPS antenna cable (with several junctions), using a GPS signal splitter to power the original AOAD/M_T antenna, and the possibility of local RF interference from a newly installed radio tower near the station. In January of this year, a UNAVCO engineer visited the station in order to find the root cause of the intermittent tracking problems. During the site visit, two receivers were installed to log additional data at the site, the analysis of which eventually lead to the replacement of the old and failing AOA D/M_T choke ring antenna. Additionally, a new low loss LMR600 antenna cable was installed and the immediate area surrounding the monument was cleared of vegetation which may have contributed to the tracking problems. Data publishing resumed starting January 24th, 2007 with a new Ashtech choke ring antenna. We are very grateful for the assistance of the personnel at the Pie Town VLBI station for their help and cooperation in restoring this important reference frame station, and also to NOAA-NGS for providing the Ashtech CGRS receiver. Figure 1 Pietown tracking plot before (top) antenna swap and after (bottom) antenna swap.